Suggested 14 day “The Ultimate” best shark diving at Aliwal Shoal & Protea Banks, followed by tropical coral reefs diving at Sodwana Bay, the southernmost tropical coral reefs in the world, topped off with a wildlife safari. With Dive The Big 5’s 20 years’ experience of creating scuba diving safaris in South Africa and combining that with a wildlife safari, Dive the Big 5 has come up with 14 days of combining the best shark diving in the world, affording the adventure diver the opportunity of encountering Bull Shark, Tiger Sharks, Sand Tiger Sharks, Hammerhead Sharks, Black Tip Reef Sharks and Dusky Sharks, and after that, diving the southernmost tropical reefs in the world, followed by a wildlife safari in a “Big 5” Game Reserve (lion, leopard, buffalo, rhino, elephant) – Hluhluwe. On arrival at King Shaka International Airport, Durban, own arrangements, you will be met by a representative of Dive The Big 5 for the 1-hour road transfer to the coastal town Umkomaas. Rest of the day free. Overnight at Agulhas House on a full board basis. After an early wakeup call, you will have a light continental breakfast before being transferred to the Umkomaas River mouth lagoon to launch the zodiac for your combination “baited” shark dive which is followed by an Aliwal reef / “Raggie” / wreck dive, weather permitting, and depending on whether this itinerary takes place in “Raggie Season” which is July through October. All diving in South Africa is best done early in the morning, at dawn, as this is when there is no wind, no swell, no currents, and definitely, the best time to dive. As the morning wears on, the winds tend to pick up causing a chop on the water, large swells, which result in unpleasant diving conditions. On a baited shark dive on Aliwal, you can also expect to encounter Duskies, Black Tip Reef Shark and, if you are really, lucky, a Zambezi (Bull) Shark and / or a Tiger Shark, depending on the time of the year, as all Shark Diving on Aliwal is seasonal, as it is everywhere else in South Africa. The modus operandi of a baited shark dive on Aliwal follows the same procedure as a “baited” shark dive that takes place anywhere in South Africa for that matter. Please be advised that the above-mentioned sharks have not read the following Shark Time Table and therefore do not know where they are supposed to be, and when. Once we arrive at the dive site, we start chumming to attract the sharks, and put out a buoy with the bait which is contained in a stainless steel “box” with holes in it so that the “smell” and oil for the sardines in the “box” permeate into the water. When the first sharks appear, the DM assesses the situation and if he is of the opinion that the sharks are going to stay around awhile and that they are not aggressive, the divers may enter the water. Either you can view the action from the “safety” of the boat, or for non-certified divers, on snorkel. Certified divers drop down to about 5 meters and follow the action from below. This is a “drift dive” as the boat, chum, and bait is drifting with the wind and surface current, as are the divers at 5 meters. Should the sharks disappear, the snorkelers and divers climb back onto the boat and we move to another location and start the process all over again. And the most asked question!!! 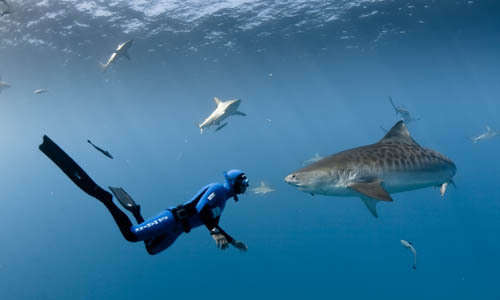 Why do we use a cage when diving with Great White’s, yet not when diving with Tigers, Bull Sharks etc? Are these Sharks not as dangerous? All wild animals in their natural environment are dangerous, but unlike Great Whites, who prey on live animals, Tiger and Bull Sharks are scavengers and prefer to eat something that’s already dead, rather than to hunt live pray. Let’s hope the Tiger Shark and Bull Shark agrees!!! After your “baited” shark dive, you will spend the surface interval time, which is not much, as your average dive depth is only 7-meters max, out at sea on the boat before commencing with your single tank “Raggie” / reef / wreck dive on Aliwal Shoal. Water and light refreshments are provided on board the dive boat. Please remember “Raggie” season is typically from July to October. The reef at Aliwal Shoal is fossilised sandstone, almost 80 000 years ago. The area around the shoal consisted of sand dunes and with heavy rains, the sand and shale dissolved forming a compound of calcium carbonate, which today forms the main body of the shoal. These reefs are covered with both soft and hard corals and have an abundance of fish life that is normally associated with coral reef diving. Aliwal is about 2½ km’s long with a width averaging 150 meters. Depths very from 6 to 27 meters (19 to 88 ft.) and the shoal offers a tapestry of diversity. The Cathedral area of the reef is one of the more spectacular dives. Its inhabitants include the Ragged Tooth Shark (in season), Loggerhead Turtle, and Ribbon Tailed Rays. In addition to the reef itself, there are also two good wrecks on which to dive. The Produce, an 18,000 ton Norwegian tanker that hit the Shoal and sank in 1974 and the second could be on the Nebo, which struck the shoal in May 1884 and sunk almost immediately with its cargo of railway material. Both wrecks lie at approximately 30 meters and are fairly intact, which makes for great wreck diving. Aliwal offers some of the best diving on the South African coastline. After the combination “baited” shark & Aliwal “Raggie” / reef / wreck dive, depending on shark activity, you will return to Agulhas House at about 13h00 for a shower and a hot “brunch”/lunch. The rest of the afternoon is free. Brett, the owner of Agulhas House, will be more than happy to “point you in the right direction” of the many local places of interest in and around Umkomaas. Such as Croc World, Tala Game Reserve, a Durban City Tour, a visit to uShaka Aquarium in Durban, a visit to the Natal Sharks Board also in Durban, a Zulu Village cultural Tour, or an Oribi George tour. The costs of these tours have not been included in the cost of this itinerary, and would be for your own account. Overnight at Agulhas House, on a full board basis (light continental breakfast, hot “brunch”/lunch & dinner). Another morning on a combination “baited” shark dive followed by “Raggie” / reef / wreck dive on Aliwal Shoal, weather permitting. Depending on shark activity, you will return to Agulhas House at about 13h00 for a shower and a hot “brunch”/lunch. After the “brunch”/lunch, you will be collected from Agulhas House by a representative of Dive The Big 5 for the 90-minute road transfer to St Michael Sands Hotel, via Aqua Planets Dive Centre, in Shelly Beach to meet with Aqua Planets dive crew, and to unpack your dive gear and to let it dry before the following days dives on Protea. We suggest that you do this immediately upon your arrival in Shelly Beach, before going onto St Mike’s. Why go via Aqua Planet’s Dive Shop you may ask?? Firstly, to dry out your dive gear and secondly, the following mornings pre-dive activities are usually hectic and rushed. After you’ve met the crew, and selected all your gear and weight requirements, you will then be transferred to St Michaels Sands Hotel & Timeshare Resort. Overnight at St Michaels Sands Hotel and Timeshare Resort on a bed and breakfast basis. At a time advised the previous day by Aqua Planet, you will be collected from St Mike’s by Aqua Planet for your mornings combination baited shark dive followed by a deep (30 meters plus) Protea Reef Dive. A baited shark dive on Protea Banks follows exactly the same procedure as the baited shark dive that you did on Aliwal Shoal, Umkomaas, with Agulhas House. After the launch from Sonny Evans Small Craft Harbour, and on arrival at the dive site, we start chumming to attract the sharks, and put out a buoy with the bait, which is contained in a stainless steel “box” with holes in it, so that the “smell” and oil from the sardines in the “box” permeates into the water. When the first sharks appear, the DM assesses the situation, and if he is of the opinion that the sharks are going to stay around awhile, and that they are not aggressive, the divers may enter the water. You either view the action from the “safety” of the boat, or, for non-certified divers, on snorkel; you float on the surface of the ocean and watch the action as it unfolds, 5 meters below you. The certified divers, already kitted up, descend to about 5/7 meters, to the depth of the bait box, and follow the action from there. This is a drift dive, as the boat, chum, and bait, is drifting with the wind and surface current, as are the divers at 5/7 meters below. Should the sharks disappear, the snorkelers and divers climb back onto the boat, and we move to another location and start all over again. After the baited shark dive, surface interval time will be on the boat, before commencing with the single tank deep Protea Reef dive. The “target species” on a Protea reef dive are Tiger Shark, Bull Shark or “Zambezi Shark” as it’s commonly referred to, Sand Tiger Sharks or “Raggies” and Hammerhead Shark, but on Protea, anything is possible! Please note that reef dives on Protea are restricted to advanced divers, or open water one divers with more than 25-logged dives, due to the depth of the dives, in excess of 30 meters, and the strong currents that are usually present on Protea. This is adventure diving at its best, and well worth the effort! Our Dive Masters, who have dived Protea for years, have mastered the art of safe diving on Protea. The DM first descends to 5 meters and waits at 5 meters until all the divers on the boat get down to him/her. Once all the divers are at 5 meters, the group descends together, to the bottom, which is at about 30 meters. Those divers that are heavy breathers are buddie paired off, so that when they get low on air, they surface together as a pair. After the Protea Reef dive, you will be transferred back to St Mike’s for a hot breakfast. Please note that breakfast could be served to the divers before they depart the hotel for their first dive of the day, or it could be a packed breakfast supplied by St Mike’s, to be enjoyed on the boat in between the first the baited shark dive and the Protea Reef dive. After the second dive, the rest of the afternoon is free to explore your new surrounds. Shelly Beach is quite a large holiday coastal town with many restaurants, pubs, movie houses, and shopping malls. Other attractions / activities nearby include, Pure Venom Reptile Park, Crags View Wild Care Centre, the Margate Art Museum, Uvongo River Nature Reserve, Oribi Gorge, which is a 20 km drive from Shelly Beach, The Wild Coast Casino, which is nearby, a coffee farm in the neighboring town of Ramsgate. If you are a golfer…… lots of top-class golf courses in the vicinity, surfing, fishing etc. etc. The folk at Aqua Planet or at St Michaels will be happy to point you in the right direction. Any additional dives and local touring would be for your own account. Overnight at St Mike’s on a bed and breakfast basis. No diving today as you have a full days road transfer from Shelly Beach to Sodwana Bay. This is a transfer of 480 km’s or 5-hours. To break the journey we have included a 2-hour boat cruise on the St Lucia Estuary, to view the hundreds of hippo and crocodiles who live in the Estuary, before continuing onto Sodwana Bay. After a leisurely breakfast, the first after having set foot on African soil, you will be collected from St Mike’s, at 09h00, by a representative of Dive The Big 5, for the 5 hour road transfer through the heart of “The Kingdom of the Zulu” to Sodwana Bay. En route to Sodwana (“Soddies” as its commonly and affectionately known,) you will make a detour to the Lake St Lucia Estuary, and board the Advantage Cruiser for a 2-hour boat cruise up the St Lucia River Estuary for close up sightings of hippo, crocodile, mangrove swamps, birds, and many more other animals. The main idea of visiting the St Lucia Estuary is that after the cruise, you leave the boat with more knowledge of the eco system, and go back home with photographs and memories of the animals that inhabit the Estuary. The boat is equipped with a fully licensed bar; tuck shop, toilets, PA system, and the popular sundeck for better viewing. The boat is built to venture into shallow waters, for those up close photos of hippo and crocodile. After the boat cruise, you will continue on to “Soddies.” Sodwana Bay forms part of The Greater St. Lucia Wetland Park, which was declared a world heritage site in 1999 and is one of 552 heritage sites worldwide. It is now known as the iSimangaliso Wetland Park World Heritage Site. On arrival at Sodwana Bay Lodge, you will have the rest of the afternoon free. Overnight at Sodwana Bay Lodge on a dinner, bed, and breakfast basis. After an early wake up, you will walk the short distance from your room to the dive centre where you will meet “the Crew,” sign the indemnity, kit-up, and transfer to the beach. On arrival at the beach, you will assemble your scuba equipment, attend dive planning, and help launch the “duck,” for the two planned dives on 2-Maile Reef, one of the many magnificent coral reefs of Sodwana Bay, weather permitting. The surf launches at “Soddies” are far tamer than the launches at both Aliwal and Protea. The reefs at Soddies are the southernmost coral reefs in the world and are even more south than Australia's Great Barrier Reef. The Great Barrier Reef has 1 800 species of fish, and Sodwana, which is 1/10 the size of the Great Barrier Reef, has 1 200 species of fish, six of which are endemic to the Sodwana area. Your chances of seeing more species of fish are greater at Sodwana, than on the Great Barrier Reef, due to the concentration of the fish in the area that you are diving on! Both your dives are scheduled for 2-Mile Reef, the largest of Sodwana’s Reefs. Should you wish to dive on either Five-Mile Reef, Seven-Mile Reef, or the fabulous and seldom dived Nine-Mile Reef, the applicable far reef surcharges would be for your own account, and dives on these far reefs should be booked in advance, at the dive centre at the lodge. Sodwana’s reefs are all unromantically named by the distance they are from the launch site, Jesser Point. For a deep dive, Sponges is a must, and is best dived on Nitrox, which is available at Sodwana at an extra cost. Please be advised that all diving in South Africa is best done early in the morning, just after sunrise, because as the morning wears on, the wind tends to pick up, causing a chop on the water, which makes for unpleasant and even dangerous diving. This leaves the afternoons free to explore the Isimangaliso National Park. In addition to diving, and deep-sea fishing, the Lodge has a Spa, and offers microlight flights of between 10 and 45-minute durations, boat based snorkeling, and whale watching from June – November. None of these activities have been included in the cost below and would be for your own account. Overnight Sodwana Bay Lodge on a dinner, bed and breakfast basis. Unfortunately, only 1 x 2-Mile Reef dive today as after the dive you need to transfer from Sodwana Bay to the Hluhluwe / Imfolozi Game Reserve to be at the lodge by 15h00, in time to join the afternoon / night safari. This is a distance of 130 km’s or a 2-hour drive. After the dive, you will return to the Lodge for breakfast, a shower, and checkout, before being transferred by a representative of Dive The Big 5 to Rhino Ridge Safari Lodge in the Hluhluwe / iMfolozi Game Reserve. This is a 122 km / 2h30 road transfer. The objective is to get you to Rhino Ridge Safari Lodge before 3:00pm, so that you have time to check in, and join the afternoon safari / game drive, which departs Rhino Ridge Safari Lodge at 3:30pm. Hluhluwe is one of the oldest and largest game parks in South Africa; the Hluhluwe-Umfolozi Park is renowned for its wide variety of bird and animal life. Besides ‘The Big Five’ (lion, leopard, elephant, rhino and buffalo), the elusive cheetah, wild dogs and many other well - known Bushveld species inhabit the park, offering the visitors a rich game viewing experience. The park covers 96 000 hectares, and comprises three reserves: Hluhluwe and Umfolozi – two of Africa’s oldest game reserves, both founded in 1895 – and the linking Corridor Reserve, proclaimed in 1989. Hluhluwe has the distinction of being the oldest “formally” protected area in Africa! In 1895, with about only 20 southern white rhinos surviving on earth, and these in Imfolozi, the threat to the species survival was dire, and the proclamation of the Hluhluwe / Imfolozi Game Reserves ensured their survival. Hluhluwe / Imfolozi Game Reserves now “export” white Rhino’s to reserves all over Africa where they were originally found. A truly wonderful success story! As previously stated, it is planned to get you to Rhino Ridge Safari Lodge in Hluhluwe/iMfolozi before 3:00pm, in time to check in and enjoy high tea. After tea you will assemble in the reception area where you will be introduced to your Ranger and Tracker and depart the lodge at 15h30 for your afternoon / evening game drive (safari). This safari is conducted in "open" Land Cruisers with professional guides. After the 3-hour safari, at about 7:00pm, depending on animal activity, you will return to Rhino Ridge Safari Lodge for dinner. Dinner will be either in the restaurant or on the deck, under the African stars. Overnight at Rhino Ridge Safari Lodge in a Safari Room, on a fully inclusive basis. Two full days spent on safari with Rhino Ridge Safari Lodge in Hluhluwe / iMfolozi. You will be woken up at 06h00 by an early morning wake up telephone call for early morning tea / coffee and “rusks” which are served in the lodge’s public area, after which you will depart on your early morning safari at about 07h00. Please check departure times with reception the night before, as this changes month to month, depending on sunrise. All animal viewing is best done in the early morning and late afternoon when it’s cool. This is when the animals are more active and easier to spot. From about 10h00 till 15h00, when the day is at its hottest, the animals tend to lie in the shade, not moving, which makes for difficult game viewing. While on safari, you will stop somewhere in the bush for tea / coffee and snacks, after which, you will continue on with the safari. Depending on animal activity, you will return to the lodge at about 10:00am for “brunch”. Rest of the morning / afternoon free to laze by the pool, visit the Spa, spend time bird watching around camp, or join a three hour guided bush walk. Please note that the cost of the guided bush walks is ZAR 580 per person and is not included in the cost below, and would be for your own account. At about 3:00pm, you will again assemble for high tea before departing on the evening safari. At sunset you will stop somewhere in the bush for “sundowners” whilst you watch the African set below the horizon. After sunset, you will continue with the safari into the night, looking for the nocturnal animals with the aid of a powerful spot lamp. After the evening safari, depending on animal activity, you will return to Rhino Ridge Safari Lodge for dinner. Overnight at Rhino Ridge Safari Lodge in a “Safari” room on a fully inclusive basis. In between morning and evening game drives, the following activities are available at Rhino Ridge: A visit Isimangaliso Wetland Park; a visit Lake St Lucia; a visit to the Border Caves; a visit to the Nongomo Market; a cultural tour. The costs of these activities are not included in the cost of this tour, and will be for your own account. After the early morning safari followed by “brunch,” you will be collected from Rhino Ridge Safari Lodge by a representative of Dive The Big 5 for the return 4 hour road transfer back to King Shaka International Airport – Durban. End of services.